It's probably just human nature that ogling what's new occupies so much of the attention of so many people so much of the time at events like the Sun 'n Fun Fly-In. After all, it is arguably one of the most important shows on the annual aviation calendar. 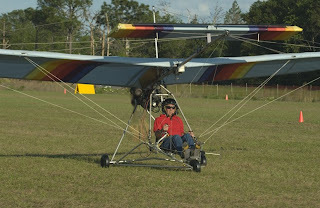 But periodically it's something old that stops traffic and conversation, and when this American Aviation Eagle ultralight rolled out to the Paradise City runway this week, you could easily differentiate between the relative newcomers to the show and the ultralight veterans who populated the area 25 years ago--back when the Eagle was new and exciting and as exotic looking as it was easy to fly. As old as the Eagle is, there is another historical note to attach to these photos. 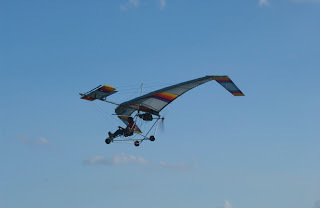 The pilot at the controls is none other than John Moody, the 1970s hang glider pilot credited for launching the ultralight movement when he first brought to Oshkosh an Easy Riser bi-wing hang glider with a small two-stroke engine mounted on the back. Moody's demonstrations of launching a powered hang glider from level ground--using only his feet for landing gear--both stopped the crowds and started a movement that continues to evolve. Oh, yeah, he's still flying an Easy Riser with retractable, uh, feet.